Cover Title: "The New Fantastic Four?!" Story Title: "Those Who Would Destroy Us"
Dr. Doom, Hulk and Dragon Man leap from a passing airplane to begin their assault on Nova! At the headquarters of the Fantastic Four, Nova is discussing his recent activities with the Thing and She-Hulk. The Human Rocket asks Ben (aka The Thing) about Epyrus 7 and explains the looming threat of Deathstorm. Ben tells Nova that even though the FF has gone their separate ways and has no information about Epyrus 7, he will help him fight Deathstorm. At that moment, the villains smash their way into the FF's building! 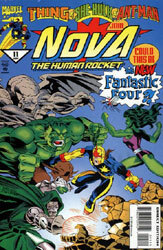 Nova and She-Hulk begin battling the Hulk while the Thing takes on Dragon Man. The three heroes quickly realize that someone else must be organizing the attack due to the limited intelligence of their foes. Dragon Man ignore Ben and heads for Nova. Nova strikes hard against the Hulk but is quickly knocked back. At the same time, She-Hulk is trying to talk to her cousin, the Hulk, and make him stop his rampage. The force of the Hulk's punch has taken Nova to another part of Four Freedoms Plaza. Nova lands hard on the floor and finds himself face-to-face with Dr. Doom! The young hero asks Doom why he's come after him. The armored villain explains that he doesn't care about Nova but wants to be free of his programming and boost his power. Nova realizes that someone else, not Doom, must be the leader of the villain's attack. Dr. Doom offers Nova the opportunity to flee or die. The Human Rocket refuses to back down and begins to launch himself towards Doom. Just then, the tiny hero known as Ant-Man tells Nova to wait. Caught by surprise, Nova gets blasted by Doom and is hurtled back to the main fight. As the three villains begin to battle the three heroes, the Hulk accidentally steps in front of Dr. Doom's blast. The force knocks the heroes and the Hulk out of the building and towards the street below! Nova grabs the unconscious Thing and She-Hulk just in time and lets the Hulk hit the pavement! In the stronghold of the Shadow Consortium, Thera (the true leader of the attack) watches in disgust. Thera reveals that the villains are actually androids but she hadn't anticipated them retaining the personalities of the originals. As a result, the Dr. Doom android has subverted the self-destruct mechanism in itself and the Hulk android. Thera tells her associate, Dante, to unleash their newest weapon, Armada! Meanwhile, at the New Warriors' Crash Pad, Night Thrasher and Namorita are discussing Nova's recent revelations about Deathstorm. Both are worried that Rich's obsession with the threat will cause him to act irrational. Namorita sees Nova's battle with the androids on television and rushes off to help him. Back in Four Freedoms Plaza, Ant-Man is working on stopping the androids. He had stopped Nova's attack on Doom to prevent the destruction of certain equipment. Ant-Man needs Dr. Doom's power booster in order to destroy the destructive robots. The insect-sized hero begins rewiring the machine. Down on the street, Armada joins the battle and launches a therma-blast attack on Nova! The Human Rocket dodges the attack while She-Hulk smashes Dragon Man into the Hulk. Suddenly, Dragon Man grabs his head in pain and flees! Ant-Man grows to full-size and tells She-Hulk that he was responsible for Dragon Man's pain. He also explains that he needs a more powerful transmitter to stop the other androids. Suddenly, Ant-Man finds the solution! Ant-Man places his jury-rigged power gauntlets on Nova's wrists. He explains that the transmitter in the Ant-Man helmet was only strong enough to drive off Dragon Man but not the other androids. The insect-sized hero noticed Nova's gravimetric pulse and realized it's powerful enough to do the job. With the gauntlets in place, Nova shreds the Dr. Doom robot as it was preparing to kill the Thing! The young hero turns and blasts the Hulk android with full power. However, it appears the green-skinned robot escaped into the city's sewers. Finally, Nova lets loose on Armada and causes it to flee back to the Consortium! After the battle, the four heroes discuss their future as the new Fantastic Four. They all agree that it would be a bad idea. From the shadows steps the director of SHIELD, Nick Fury. Fury asks Nova to come with him to discuss the hero's recent activities concerning a top-secret military satellite. The Thing, She-Hulk, Ant-Man and the just-arrived Namorita tell Nova they'll stand by him if he refuses to go with Fury. Nova thanks his friends but agrees to go with Fury in order to clear his name.